Zine is a demoscene based disk magazine filled with articles and information on the demoscene and demoscene-related productions. 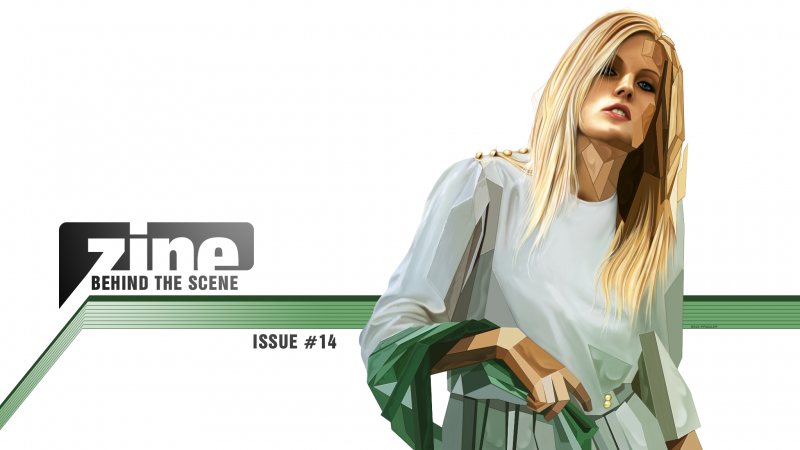 Zine #14 is now available for immediate download. The pouet page (where you can download, as well as comment) can be found Here. Zine #14 was my first official production with the Brainstorm team. It actually began a little over a year before the actual release date of the magazine. I was recruited to the brainstorm team by Bit Arts and deathy, both knew I had prior disk magazine coding experience and they were desperate to find a replacement coder that would actually accept the project after Smash dropped out of it. Most of the work that appears in the final issue, in terms of code and graphics, actually occurred in the last 40 days or so before release. The plan was to have it completed a lot sooner, but things happened and it just didn’t get done. 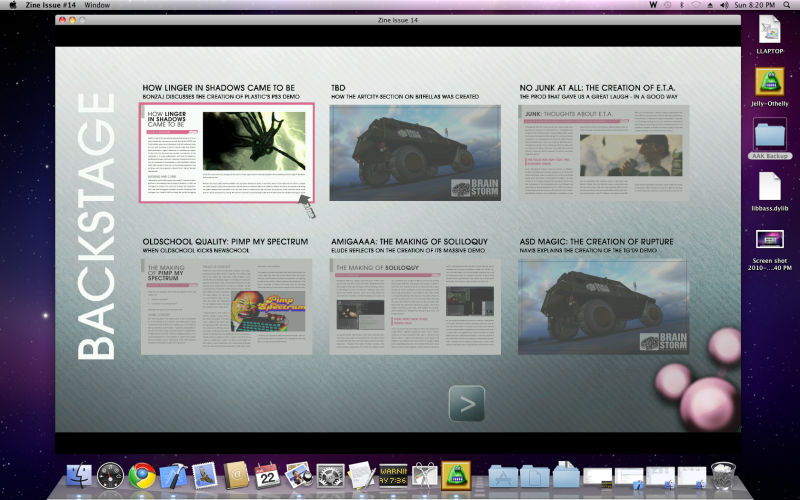 I was still coding and building the issue a few hours before going to Cologne to present it to the word! Zine #14 was released at the Evoke 2010 demo party, which I attended with my wife epec. It was truly amazing to be stood on the stage in front of all those people talking about something I had worked on. Then throughout the party, looking at peoples screens and monitors to see them reading and talking about the issue. Very inspiring, and made me feel good to have produced something people liked to read Evoke really inspired me. 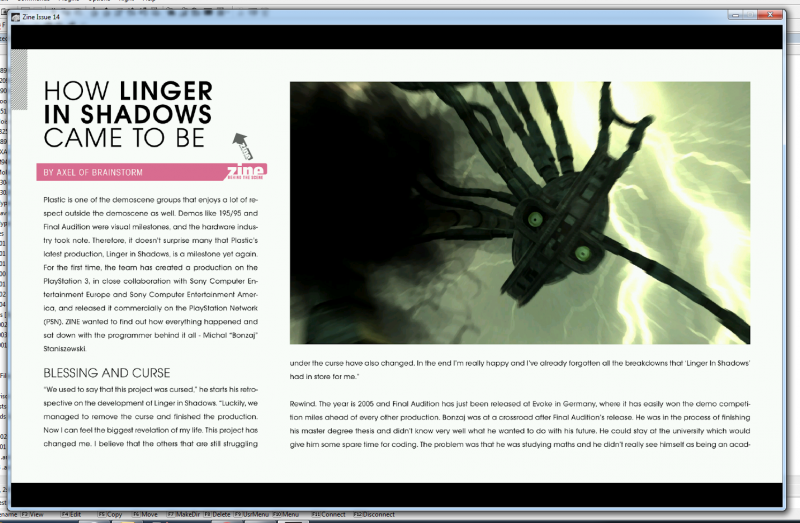 The magazine was coded using Visual Studio 2010 using C++ and custom written libraries. Builds are currently available for Windows, Mac and Linux. Nem – Thanks for your help with linux compiling issues.